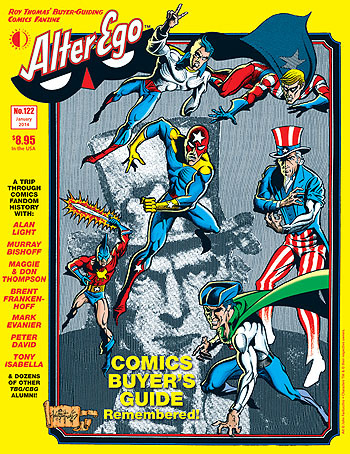 The new issue of ALTER EGO (#122, now shipping from TwoMorrows, and in stores next Wednesday), is a tribute to the late, great Comics Buyer’s Guide, offering CBG‘s founders and past contributors a chance to pay their respects to the long-running news/adzine. When I heard CBG had been cancelled back in January, even though I hadn’t been a regular subscriber for many years, I felt a real painful twinge; not just because of its place as my main source of comics news as a kid, but because of the way it went out. Just one issue shy of #1700, Krause Publications cancelled it with no advance notice to its contributors, so they didn’t have a chance to produce a final issue. So I got on the phone to Roy Thomas, with the idea of, “Why don’t WE do the ‘final” issue of CBG as a special Alter Ego tribute issue, and round up all the past and present contributors and columnists to give it a proper farewell?” Roy was hesitant at first, since his mag generally covers comics from the Golden Age up till about 1972, and after all, The Buyer’s Guide for Comic Fandom (or TBG as it was originally known) didn’t even start publication till 1971, and hit its heyday well after Roy’s self-imposed 1972 cutoff for AE coverage. But Alter Ego‘s so focused on paying respect to the roots of comics fandom, that it didn’t take much effort to persuade Roy that it made sense to be part of AE. Roy rounded up almost all of the columnists I remember from my days reading TBG/CBG, including Mark Evanier, Tony Isabella, Peter David, Fred Hembeck, John Lustig, plus founder Alan Light and his second-in-command Murray Bishoff, as well as Maggie Thompson and Brent Frankenhoff, who were all delighted to have a chance to give it a proper send-off. If you, like me, grew up ordering comics through ads in TBG, and getting your comics news in CBG, I guarantee you will love this issue. My thanks go out to everyone who was a part of it, and to all those great CBG contributors who made it such a great read for over 40 years. This entry was posted in TNT on 5 December 2013 by Mr. Morrow.